Kerry Lyon Grossman teaches Legal Research and Writing and Depositions and Discovery for the UCLA School of Law Clinical Program. Before joining the UCLA faculty, she was a litigator at the Los Angeles office of O'Melveny & Myers LLP for nine years. 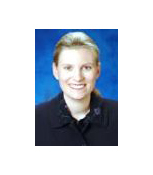 Her practice at O'Melveny focused on intellectual property, media, and antitrust matters. Ms. Lyon Grossman obtained her B.A. in Biological Basis of Behavior at the University of Pennsylvania and her J.D. at Harvard Law School.